It’s not too late to get your calendars printed for 2019. The year has barely begun and January isn’t quite over yet so why not hop on that thing you’ve been delaying and get yourself, or your business, some personalised calendars. It doesn’t matter how many you need, whether it’s a single one for your office or a bulk order to give away, we can print them quickly, cost effectively, and to a high quality. One of the main advantages we offer on calendars is our completely bespoke approach to printing that lets you customise exactly how you want them to look and feel. We can print on a vast array of paper stocks including the standard silk or uncoated papers in and array of different weights. Should you wish to elevate your calendar printing to the next level we do also have some more specialised paper stocks. We can even print the covers on a different stock if you want them to have a slightly different look. Along with the different paper types we can also provide a number of bespoke finishing options to your calendar print. 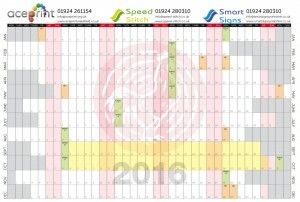 This means we can provide calendars printed to any size, including odd sizes. It also lets us produce different types of calendars from desk calendars and desk pad calendars to more traditional wall hanging calendars. We can even provide lamination on the calendars if you wish, though we normally suggest this only applies to the covers if you intend to write inside it. If you have a grand vision for your calendars or designs files that are print ready we’re more than happy to just put that into production for you. If you don’t have any ideas, or maybe just the basics of one, then our design team is ready to create something truly magical for you. Just provide them with as much or as little detail as you like and they’ll spin it into a design you’ll be more than happy with. To find out more about our 2019 calendar printing, or to place your order, just call us today on 10924 261 154 or send an email to info@aceprint.org.uk.